Ronald Vernie Dellums (November 24, 1935 – July 30, 2018) was an American politician who served as Mayor of Oakland from 2007 to 2011. 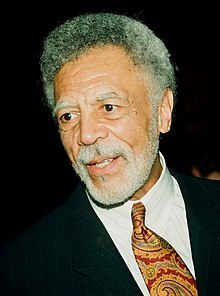 He had previously served thirteen terms as a Member of the U.S. House of Representatives from California's 9th Congressional District, in office from 1971 to 1998, after which he worked as a lobbyist in Washington, D.C.
Dellums was born into a family of labor organizers, and enlisted in the United States Marine Corps before serving on the Berkeley, California, City Council. He was the first African American elected to Congress from Northern California and the first successful openly socialist non-incumbent Congressional candidate after World War II. His politics earned him a place on President Nixon's enemies list. During his career in Congress, he fought the MX Missile project and opposed expansion of the B-2 Spirit stealth bomber program. When President Ronald Reagan vetoed Dellums's Comprehensive Anti-Apartheid Act of 1986, a Democratic-controlled House and a Republican-controlled Senate overrode Reagan's veto, the first override of a presidential foreign-policy veto in the 20th century. A statue of Dellums's uncle, labor organizer C. L. Dellums at the Oakland Amtrak station. Dellums was born in Oakland, California, to Verney and Willa (Terry) Dellums. His father was a longshoreman. His uncle, C. L. Dellums, was one of the organizers and leaders of the Brotherhood of Sleeping Car Porters. He had a younger sister Theresa. His mother Willa died on August 17, 2008, at the age of 89. Dellums attended Oakland Technical High School and McClymonds High School. He served in the United States Marine Corps from 1954 to 1956. Dellums later received his A.A. degree from the Oakland City College,now Merritt College in 1958, his B.A. from San Francisco State University in 1960, and his M.S.W. from the University of California, Berkeley in 1962. He became a psychiatric social worker and political activist in the African-American community beginning in the 1960s. He also taught at San Francisco State University and the University of California, Berkeley. Dellums was a member of Alpha Phi Alpha fraternity. He was also a member of the fraternity's World Policy Council, a think tank whose purpose is to expand the fraternity's involvement in politics, and social and current policy to encompass international concerns. Dellums was married three times. He married his second wife, attorney Leola "Roscoe" Higgs, in 1961. The two divorced in 1998. He married his third wife, Cynthia Lewis, in 2000. One son, Michael, was convicted of a drug-related homicide in 1979, and remains in prison, being repeatedly denied parole due to bad behavior. Dellums had four other children: professional actor Erik, Piper, Brandon and Pam; five grandchildren: Danielle Henderson, Jacob Holmes, Sydney Ross, Dylan Ross, and Olivia Dellums; and two great-grandchildren: Jared Henderson and Charli Henderson. Dellums's career in politics spanned over forty years. He held positions on the Berkeley City Council, in the United States House of Representatives, and was the mayor of Oakland from 2007 to 2011. Dellums was elected to the Berkeley City Council, after prompting from Maudelle Shirek, and served from 1967 to 1970. Dellums was elected to the United States House of Representatives in 1970 after being recruited by anti-Vietnam War activists to run against the incumbent, Jeffery Cohelan, a white liberal close to organized labor who had not opposed the war early enough to win reelection in the district. Dellums defeated Cohelan in the Democratic primary and won the general election, serving without interruption for 27 years. In 1972, Dellums was reelected to Congress, 60 to 38 percent over his Republican opponent, Peter D. Hannaford, an advisor to then Governor Ronald Reagan. His politics earned him a place on the so-called Nixon's Enemies List, where his notation stated Dellums "had extensive EMK-Tunney support in his election bid." During his tenure in Congress, Dellums opposed every major American military intervention, except for emergency relief in Somalia in 1992. Dellums also supported the restriction of foreign aid to repressive African governments in Zaire (present-day DRC), Burundi, Liberia and Sudan. In 1972, Dellums began his campaign to end the apartheid policies of South Africa. Fourteen years later, the U.S. House of Representatives passed Dellums's anti-apartheid legislation, calling for a trade restriction against South Africa and immediate divestment by American corporations. The bill, the Comprehensive Anti-Apartheid Act of 1986, had broad bipartisan support. It called for sanctions against South Africa and stated preconditions for lifting the sanctions, including the release of all political prisoners. President Reagan called for a policy of "constructive engagement" and vetoed the bill; however, his veto was overridden. It was the first override in the 20th century of a presidential foreign policy veto. Dellums's fight against apartheid in South Africa was the subject of a Disney Channel made-for-TV film, The Color of Friendship, released in 2000. The role of Congressman Dellums was played in the film by actor Carl Lumbly. As part of the Cold War struggle for influence in southern Africa, the United States joined with the apartheid government of South Africa in support of UNITA, led by Jonas Savimbi, against the ultimately victorious Angolan forces of the MPLA supported by the Soviet Union and Cuba. Dellums was criticized for his support of Fidel Castro's involvement with the MPLA in Angola and was called "the prototype of the Castroite congressman" by the conservative press. He also introduced legislation (which was unsuccessful) in September 1987 to prohibit economic and military assistance to Zaire, citing poor human rights, corruption, and collaboration with South Africa. In 1990, Dellums and 44 of his congressional colleagues sued then-president President George H. W. Bush in D.C. Federal District Court in 1990, in the case Dellums v. Bush, 752 F. Supp. 1141 (1990) attempting to halt a preemptive military buildup in the Middle East in response to Iraq's invasion of Kuwait. The plaintiff members of Congress asserted that military action without a declaration of war would be unlawful under U.S. Const. art. I, § 8, cl. 11 of the United States Constitution. Dellums v. Bush is notable in that it is one of only a few cases in which the Federal Courts have considered whether the War Powers Clause of the U.S. Constitution is justiciable in the courts. The Court in Dellums v. Bush indicated that, in that instance, it was, but because Congress had not yet acted as a majority, the lawsuit was premature. Throughout his career Dellums led campaigns against an array of military projects, arguing that the funds would be better spent on peaceful purposes, especially in American cities. Programs he opposed included the Pershing II and MX missiles, and the B-2 bomber (popularly known as the "stealth bomber"). Because of his commitment to the closing of unneeded military bases, Dellums did not oppose the closing of the former Naval Air Station Alameda in his own district. The B-2 Stealth Bomber is a long-range strategic bomber, that features stealth technology that makes it far less visible to radar. The B-2 was a major technological advance; however, it was designed during the Cold War for military scenarios that some argued were less relevant following the collapse of the Soviet Union. Its total program cost was estimated in 1997 at over US$2.2 billion per airplane. Although Dellums opposed the B-2 project from the start, Congress approved initial funding for production of 135 bombers in 1987. However, with the winding down of the Cold War, total B-2 production was reduced to 21 aircraft in the early 1990s. But in 1997, seven former Secretaries of Defense signed a letter urging Congress to buy more B-2s, citing the difficulty of assembling a similar engineering team in the future should the B-2 project be terminated. Dellums, citing five independent studies consistent with his position, offered an amendment to that year's defense authorization bill to cap production of the bombers with the existing 21 aircraft. The amendment was narrowly defeated; nonetheless, Congress never approved funding for additional B-2 bombers. In January 1971, just weeks into his first term, Dellums set up an exhibit of Vietnam war crimes in an annex to his Congressional office, coordinated with the Citizens Commission of Inquiry (CCI). The exhibit featured four large posters depicting atrocities committed by American soldiers, embellished with red paint. The My Lai massacre was followed shortly thereafter by a series of hearings on war crimes in Vietnam, which began April 25, 1971. Dellums had called for formal investigations into the allegations, but Congress chose not to endorse the proceedings. As such, the hearings were ad hoc and only informational in nature. As a condition of room use, press and camera presence were not permitted; however, the proceedings were transcribed. A small number of other anti-Vietnam War congressional representatives also took part in the hearings. In 1993, Dellums was Chairman of the House Armed Services Committee. Though he argued in favor of integration, Dellums was the sole sponsor of H.R. 2401, introduced on June 14, 1993, adding language to the Defense Authorization Act of 1994 to ensure continued support for unit cohesion in the military. Although the bill contained that language, Dellums pointed out that he personally found the language unacceptable, stating in the Congressional Record on August 4, 1993: "The bill also contains at least one policy that, while unacceptable to this Member in substantive terms, is not as retrograde as it might have been: It supports the President and the Joint Chiefs of Staff on the issue of allowing gay and lesbian service members to serve their country." Remaining in the bill was Title V Section G "[e]xpresses as congressional policy the prohibition against homosexual conduct or activity in the armed forces. Requires separation from the armed forces for such conduct or activity. Directs the Secretary to ensure that the standards for military appointments and enlistments reflect such policy." Dellums's "yes" vote on the bill with the unit cohesion support language was the first time in his 22-year congressional tenure that he voted in favor of any defense spending bill, previously opposing them on economic principles. However, Dellums gave several economic reasons in the Congressional Record for his "yes" vote, on H.R. 2401, including that "It cuts ballistic missile defense to $3 billion—less than one-half the level planned by the Bush administration ..." and: "it devotes a record $11.2 billion to environmental cleanup and improvement, and does so in a way that will stimulate the development of new technologies and new markets for American firms". Dellums served as chairman of the House Committee on the District of Columbia and the House Armed Services Committee. Dellums also served on the Foreign Affairs Committee, the Post Office and Civil Service Committee, the Permanent Select Committee on Intelligence, and the Select Committee to Investigate the Intelligence Community. Dellums co-founded the Congressional Black Caucus in 1971. Dellums's official portrait in the 103rd Congress, 1993. Dellums was reelected 11 times from this Oakland-based district, which changed numbers twice during his tenure–from the 7th (1971–75) to the 8th (1975–93) to the 9th (1993–98). He only dropped below 57 percent of the vote twice, in 1980 and 1982. In his last House election race, in 1996, Dellums bested his opponent, Republican Deborah Wright, by a 77%–18% margin. In 1997, Dellums announced that he was retiring from Congress in the middle of his term, forcing a special election for the balance of his term — which created a series of five special elections in 12 months as various East Bay politicians ran for different political offices. For more detailed information, see Special election musical chairs. Dellums's successor, Barbara Lee, won the 2000 election by an even larger, 85%–9% margin. Congressman Ron Dellums is revered on both sides of this aisle because of his integrity and his commitment to progressive ideas. He was always on the cutting edge of the issues. California will miss him in the ninth district, but the State has been enriched by Ron Dellums. While he towers above most of us physically, this attribute is matched by his intellect, faith in the process and optimism for peaceful resolution of conflict. A creative, piercing, probing, incisive, thought-provoking, inspiring, charismatic, careful, considerate and deliberative mind. The mind to stand up when others sit down. The mind to act when others refuse to act. The mind to stand even when you stand alone, battered, bruised and scorned, but still standing. Standing on principle, standing tall and standing for the people. House Majority Leader Tom DeLay described Dellums as "...one of the most giving, open and stalwart, a real stalwart man when he was Chairman"
We are losing one of its finest Members, a Member that I have great respect for, because he always did his homework, was so articulate and eloquent on this floor. He always got my attention when he stood up and took the microphone. He would stop every Member in their tracks to hear what he had to say, and there are very few Members that have served in this body that can claim the respect that both sides of the aisle had for the gentleman from California. And the incredible reputation that the gentleman from California has brought to this House; he has elevated this House. He has elevated the distinction of this House by serving here, and this House will greatly miss him when he leaves. Dellums's voting records in Congress were "almost without exception straight As" from groups such as the Sierra Club, the National Organization for Women and the AFL-CIO. He received 100% on consumer group Public Citizen's scorecard. In contrast, he received an "F" from NumbersUSA, a group dedicated to limiting immigration. An eight-month investigation cleared Dellums of allegations that he had used cocaine and marijuana, finding there was no basis for the allegations. The investigation of Dellums and two other congressmen, Texas Democrat Charlie Wilson and California Republican Barry Goldwater Jr., began in 1983, based on a complaint from a House doorkeeper, who pleaded guilty to drug charges on Capitol Hill himself in March 1983. In 1976, Dellums was nominated for president by the National Black Political Assembly but refused, stating "It is not my moment; it's not my time." That year, he received 20 delegate votes at the Democratic National Convention for the Vice-Presidency. Four years later, he was again nominated as the presidential candidate, this time for the Independent Freedom Party, but refused the nomination because the IFP had not yet created an effective political structure. In that year's Democratic National Convention, Dellums received three delegate votes for the Presidential nomination. Dellums worked as a legislative lobbyist, which drew criticism described in the East Bay Express, a local newspaper. Shortly after leaving office, Dellums began consulting for an international health-care company, Healthcare Management International which invests in health insurance programs in developing countries. Dellums worked in Washington, D.C., as a lobbyist for clients such as the East Bay Peralta Community College District and AC Transit, the public transit district charged with offering mass transit throughout the East Bay. Dellums's firm lobbied for Rolls Royce, a company that manufactures aircraft engines. He also worked on behalf of the San Francisco International Airport during its attempts to build additional runway capacity, which has been vigorously opposed by environmental groups. His company was engaged in community relations work for the Lawrence Berkeley National Laboratory which generates and handles radioactive waste, and has long had a contentious relationship with its residential neighbors and the Berkeley city council. In addition he lobbied for Bristol-Myers Squibb, a multinational pharmaceutical corporation. In 2017, Bill Browder testified before the Senate Judiciary Committee that representatives of Vladimir Putin had hired "Howard Schweitzer of Cozen O'Connor Public Strategies and former Congressman Ronald Dellums to lobby members of Congress on Capitol Hill to repeal the Magnitsky Act and to remove Sergei's name from the Global Magnitsky bill." The bill is named for the Russian lawyer who was murdered in prison for pursuing the corruption of Putin's allies. Browder also worked with the Human Rights Accountability Global Initiative to oppose sanctions on Russia. Dellums lobbied for the Haitian government in 2001–2002 and worked to support Jean-Bertrand Aristide, the first democratically elected, former President of Haiti who was deposed in a 2004 coup. When running for mayor of Oakland, Dellums listed his most recent profession as "retired Congressman" in election filing forms. When assistant City Clerk Marjo Keller informed the Dellums campaign that this description was unacceptable, the campaign elected to leave the occupation field blank. A former East Bay Express columnist once wrote a column titled "Dellums for Dollars" criticizing Dellums's lobbying. Speaking in defense of Dellums, Alameda County Supervisor Keith Carson said that, if asked, Dellums would likely say "just because I'm advocating for a company that may be paying me consulting fees, I'm not selling out my beliefs." After Oakland Council President Ignacio De La Fuente and District 3 City Councilmember Nancy Nadel declared their mayoral candidacies, Dellums was recruited to run for Mayor of Oakland. An informal committee, "Draft Dellums", collected 8,000 signatures and presented them to the former Congressman at a public meeting at Laney College. Crowds of Oaklanders chanted "Run, Ron, Run". In October 2005, reportedly after weeks of deliberation and speculation, Dellums announced that he would run for mayor of Oakland. The incumbent mayor, former California Attorney General and current California Governor Jerry Brown, was prohibited by term limits from running again. On June 16, 2006, after a careful ballot count, and a dispute over whether votes for unqualified write-in candidates such as George W. Bush and Homer Simpson counted towards the total, Dellums was unofficially declared the winner in the Oakland mayoral race. Dellums garnered a 50.18 percent majority to win the election. This was 155 votes more than needed to avoid a runoff. Dellums received 41,992 votes, while his nearest challengers received 27,607 votes, and 10,928 votes respectively. Mayor-Elect Dellums's transition to office involved 800 Oaklanders who joined 41 task forces to make recommendations on issues ranging from public safety to education and affordable housing. Many of these recommendations helped to shape the policy agenda of the Dellums administration. The task forces recommended a land use policy which would emphasize zoning for job-creating business. This policy was adopted in 2007, and the city is being zoned. The task forces recommended a stronger policy on the hiring of local residents, and the City Council appointed a group to pursue this change. The task forces recommended a focus on the green economy, and the Mayor, along with a variety of community organizations created the Green Jobs Corps, an office of sustainability and the East Bay Green Corridor. Mayor Dellums reported that approximately two-thirds of the recommendations had been implemented as of the end of 2009. The Task Forces and the Inauguration itself, which included hundreds of the city's least affluent residents, were considered examples of grassroots democracy. Crime rates were high when Dellums took office in January 2007 and at his first State of the City Address in January 2008, Dellums called for hiring more police officers. Dellums promised that by year's end, the police department would be fully staffed at 803 officers. On November 14, 2008, 38 Oakland police officers were added to the force after graduating the 165th academy, bringing the department's force to 837 officers, the most in OPD history. In addition, to follow through on his calls for hiring more officers, Dellums offered Measure NN on the November 2008 ballot, a voter initiative parcel tax to hire 70 additional police officers at a hiring and training cost of $250,000 each. Though 55 percent of Oakland voters supported Measure NN, this failed to meet California's "two thirds" constitutional requirement for the enactment of a new tax. Dellums's administration negotiated the passage of a new police contract which was especially noteworthy, as it broke the Oakland Police Officers Association's opposition to the civilianization of certain OPD positions which were previously staffed by "sworn," uniformed police officers, with concomitant payrolls and police academy training costs. OPD then hired "non-sworn" personnel to work some of its desk jobs and administrative jobs, freeing up academy uniformed officers for street patrol and investigative work. On Saturday, March 21, 2009, during the 2009 Oakland police shootings incident, the Oakland Police Department lost three sergeants and one officer. One of the officers left instructions in his emergency packet that if he were killed in the line of duty that Dellums not be permitted to speak at his funeral. Two of the officers' families requested the same, and when Dellums attended the March 28 public memorial service at the Oracle Arena he honored the requests. In his State of the City address in 2008 Dellums promised to reduce the crime rate by 10% during 2009; the crime rate actually went down by 13%. In 2009 Dellums hired the highly regarded Anthony Batts, formerly the Long Beach police chief. Batts had a record of reducing both crime and police shootings in that Southern California city. Noting that reducing teacher turn-over and improving the engagement of teachers with the families of their students would require increasing the number of teachers who came from the local community, Dellums initiated a program to create more teachers who were diverse local residents. He held teacher recruitment summits in City Hall, helped the Teach Tomorrow in Oakland program to obtain $2.7 million in federal funding, and spoke to the U.S. Conference of Mayors about the national potential of such programs. The Community Task Forces remained active in these efforts. In 2009 Dellums launched an anti-drop-out initiative which included sponsoring back to school rallies at City Hall and participating with the school district in truancy reduction efforts. He accepted an invitation from the national organization, America's Promise, to join their efforts at drop-out prevention. As part of this effort, he started Oakland's Promise, recruited several dozen community-based organizations to participate, held a Summit with 350 participants, and adopted an Action Plan to cut Oakland's drop-out rate in half. As Mayor, Dellums proposed the idea of Oakland as a "Model City". He argued that Oakland is "big enough to be significant and small enough to get your arms around", and that the federal government needs a city like Oakland on which to try out new urban policy inventions. From 2008, Dellums campaigned to bring millions in American Recovery and Reinvestment Act federal stimulus funding to Oakland, using both his extensive Washington D.C. contacts and the idea of the Model City. By the end of 2009, his efforts had yielded US$65 million in stimulus funding for Oakland, including the largest police grant of any city in the country, and the second largest amount in competitive funding after Chicago. After his election as mayor of Oakland, Dellums came under criticism for a wide range of issues, including a lack of transparency in government, ineffectual governance, and alleged extended absence from his duties at City Hall. He was criticized for refusing to disavow a staff-generated letter sent in his name in July 2007 to a Federal Bankruptcy Court in support of the Your Black Muslim Bakery, whose owners were suspects in the 2007 murder of reporter Chauncey Bailey. In 2009, Dellums and his wife were cited with failure to pay over $239,000 in federal income taxes. In 2007, Oakland reporter Elise Ackerman launched an unsuccessful campaign to recall Dellums and released an open letter addressed to Dellums. When addressing a town hall-style meeting in 2007, Dellums declared: "I'm giving it everything that I have. If that's not enough, that's cool. Recall me and let me get on with my private life." Dellums later announced he would not seek a second term as mayor of Oakland in the 2010 election. He was succeeded by Jean Quan. Dellums died of complications from prostate cancer on July 30, 2018 at age 82. Though he ran as a Democrat, and caucused as a Democrat in Congress, Dellums described himself as a Socialist. He was the first self-described socialist in Congress since Victor L. Berger. In the 1970s, Dellums was a member of the Democratic Socialist Organizing Committee (DSOC), an offshoot of the Socialist Party of America. He later became vice-chair of the Democratic Socialists of America (DSA), which was formed by a merger between the DSOC and the New American Movement, and which works within and outside the Democratic Party. While running for mayor of Oakland, Dellums was officially registered as a member of the Democratic Party. On October 1, 2007, Dellums endorsed Hillary Clinton in the 2008 Democratic presidential primary at a press conference held at Laney College in Oakland. He was named national chair of Clinton's Urban Policy Committee. Dellums was a member of the ReFormers Caucus of Issue One. In 2000, Dellums published an autobiography, cowritten with H. Lee Halterman, entitled Lying Down with the Lions: A Public Life from the Streets of Oakland to the Halls of Power. ^ "Ronald V. Dellums, Representative from California". Black Americans in Congress. Office of the Clerk of the House of Representatives. Archived from the original on March 8, 2012. Retrieved February 25, 2012. ^ Maurice Isserman. "A Brief History of the American Left". Democratic Socialists of America. Archived from the original on August 2, 2006. ^ a b Lynn Norment (August 1994). "How African-Americans helped free South Africa". Ebony. Archived from the original on February 27, 2009. ^ "Mayor-elect Ron Dellums: Oakland 'can be a great city'". People's Weekly World. June 24, 2006. Archived from the original on October 2, 2006. ^ a b Jim Herron Zamora; Janine DeFao (October 8, 2005). "Dellums enters Oakland mayor race as favorite". San Francisco Chronicle. ^ "Ron Dellums, an Active Presence from California". The African American Registry. Archived from the original on October 27, 2006. ^ "Alpha chapter of Alpha Phi Alpha". Archived from the original on September 15, 2006. Retrieved October 24, 2006. ^ "Alpha Phi Alpha's World Policy Council". Archived from the original on October 10, 2006. Retrieved October 24, 2006. ^ a b "Democratic Socialists of America". www.nndb.com. Retrieved July 30, 2018. ^ Johnson, Chip (November 4, 2005). "Candidates both have problem son". The San Francisco Chronicle. ^ Burress, Charles (November 17, 2000). "The Idealist's Idealist - Maudelle Shirek". San Francisco Chronicle. Archived from the original on April 15, 2002. ^ a b "Dellums, Ronald Vernie". Biographical Directory of the United States Congress. ^ "Jeffrey Cohelan Collection". The Carl Albert Congressional Research and Studies Center. Archived from the original on August 21, 2006. ^ "CA District 07 (1972)". ourcampaigns.com. Retrieved September 19, 2013. ^ "List of White House 'Enemies' and Memo Submitted by Dean to the Ervin Committee". Watergate and the White House, vol. 1. Facts on File. pp. 96–97. Archived from the original on June 21, 2003. ^ a b Megan Rosenfeld (February 7, 1998). "A 21-Gun Send-Off". The Washington Post. p. A06. ^ "The Color of Friendship Summary, Cast & Crew - Starpulse.com". Retrieved July 30, 2018. ^ Jay Nordlinger (March 6, 2000). "In Castro's Corner — African Americans' alleged affinity for Cuba". National Review. ^ Jeffrey M. Elliot and Mervyn M. Dymally, Voices of Zaire: Rhetoric or Reality, p. 16. ^ Martin Tolchin, "MIDEAST TENSIONS; 45 in House Sue to Bar Bush From Acting Alone", The New York Times, November 21, 1990. ^ a b "Dellums v Bush". Justia, US LAW. Retrieved July 31, 2018. ^ a b Raine, George (November 17, 1997). "Dellums, retiring, says "that fire' still burns". SFGate. Retrieved July 31, 2018. ^ a b c d e Will Harper (April 3, 2002). "The Radical Insider". East Bay Express. ^ "B-2 Spirit". Federation of American Scientists. November 30, 1999. ^ "The B-2 Bomber". opensecrets.org. Archived from the original on October 15, 2007. ^ Debate on Dellums Amendment to 1998 Defense Authorization Act June 23, 1997. ^ "Vietnam War Crimes Hearings". ^ "H.R. 2401: National Defense Authorization Act for Fiscal Year 1994". Govtrack.us. ^ "H. R. 2401" (PDF). pp. 230–238. ^ a b "Congressional Record - 8/4/93". USGov. Retrieved July 31, 2018. ^ "Congress.gov - Library of Congress". thomas.loc.gov. Retrieved July 30, 2018. ^ "November 1996 General Election: California 9th Congressional District". RAND Corporation. ^ "PlusOne - A place to share your opinion". PlusOne. Archived from the original on April 10, 2005. Retrieved July 30, 2018. ^ Nancy Pelosi (February 3, 1998). "Tribute to Congressman Ron Dellums". Archived from the original on October 30, 2005. ^ Jane Harman (February 3, 1998). "Tribute to the Honorable Ronald V. Dellums". Archived from the original on October 29, 2005. ^ "de beste bron van informatie over g senet. Deze website is te koop!". gsenet.org. Archived from the original on March 15, 2012. Retrieved August 26, 2012. ^ "Ron Dellums 1998-2013". Vote Smart. Retrieved July 31, 2018. ^ St. Petersburg Times Staff (March 16, 1983). "Panel investigating reports that lawmaker bought drugs". St. Petersburg Times. ^ Henry, Charles P. "Major Problems for Minor Parties." The Crisis 97.1 (Jan 1990): 25-26, 39. ^ Lusane, Clarence. African-Americans at the Crossroads: The Restructuring of Black Leadership and the 1992 Elections. Boston: South End Press, 1994. 47. ^ a b Walton, Hanes, Jr. & Lester Spence. "African-American Presidential Convention and Nomination Politics: Alan Keyes in the 1996 Republican Presidential Primaries and Conventions." In Race and Ethnicity in Comparative Perspective. Edited by Georgia A. Persons. New Brunswick, NJ: Transaction Publishers, 1999. 205. ^ Glasrud, Bruce A. & Cary D. Wintz, eds. African Americans and the Presidency: The Road to the White House. New York: Routledge, 2010. 27. ^ Anderson, Gary. Encyclopedia of Activism and Social Justice. SAGE. p. 442. ISBN 1452265658. ^ NcDonald, Heather. "Dellums takes hit for lobbying". East Bay Times. Retrieved July 31, 2018. ^ Gray, Rosie (July 25, 2017). "Bill Browder's Testimony to the Senate Judiciary Committee". The Atlantic. Retrieved January 7, 2018. ^ Gray, Rosie (July 18, 2017). "Russian Anti-Sanctions Campaign Turned to California Congressman". The Atlantic. Veselnitskaya, the lawyer in the meeting, has been deeply involved in the anti-Magnitsky Act effort in the U.S. as part of a group called the Human Rights Accountability Global Initiative Foundation that has lobbied in Congress against the legislation ... Akhmetshin, who is currently in Europe, said in an email that there was one instance involving Behrends walking with former Democratic Congressman Ron Dellums, who was also part of the lobbying effort, to the office of the ranking Democrat on Rohrabacher's subcommittee. ^ Baker, Stephanie; Reznik, Irina (December 21, 2017). "Mueller Is Looking Into a U.S. Foundation Backed by Russian Money". Bloomberg News. ^ Phillip Matier, Andrew Ross (March 27, 2006). "In Oakland, Dellums draws fire in mayor's race". San Francisco Chronicle. ^ Jim Herron Zamora (March 10, 2006). "Dellums to leave occupation line blank on ballot". San Francisco Chronicle. ^ Heather MacDonald, "Ex-rep. thrills backers by entering Oakland mayoral race" Oakland Tribune, October 8, 2005. ^ Allen-Taylor, Douglas (January 3, 2006). "Page One Oakland in 2005: Campaigns for Mayor Begin as Brown Plans Exit". Berkeley Daily Planet. Retrieved July 31, 2018. ^ Christopher Heredia, Janine DeFao (June 18, 2006). "De La Fuente offers support to Dellums as mayoral winner". San Francisco Chronicle. ^ MacDonald, Heather (February 27, 2007). "Dellums Makes 4 Additions to His Staff". Oakland Tribune. ^ Jean Quan. "Mayor ~ City of Oakland, California". .oaklandnet.com. Retrieved August 26, 2012. ^ Mayfield, Kimberly (January 4, 2007), "Grassroots Democracy Sprouts in Oakland", San Francisco Chronicle. ^ Chris Heredia (January 15, 2008). "Dellums calls for hiring more cops in Oakland". San Francisco Chronicle. Retrieved December 13, 2008. ^ Kelly Rayburn (November 21, 2008). "No money to train police recruits, Dellums says". Oakland Tribune. Retrieved December 13, 2008. ^ Heredia, Christopher (November 6, 2008). "Oakland police tax fails". SFGate. Retrieved July 31, 2018. ^ J. Douglas Allen-Taylor (May 29, 2008). "Undercurrents: More Thoughts on Staffing of Oakland Police Department". Berkeley Daily Planet. ^ Thousands Attend Funeral For 4 Oakland Officers Archived April 4, 2009, at the Wayback Machine AP, March 28, 2009. ^ V. Smoothe, "A Better Oakland", Oakland Crime Stats, November 2009. ^ Matier, Ross (June 23, 2010). "Dysfunctional politics on display in Oakland". SFGate. Retrieved July 31, 2018. ^ "New Teacher Resources". Schoolweb.ousd.k12.ca.us. Archived from the original on July 13, 2012. Retrieved August 26, 2012. ^ Rayburn, Kelly (January 14, 2008). "Mayor Dellums outlines agenda for Oakland". Mercury News. Retrieved July 31, 2018. ^ Callahan, Lauren (December 10, 2009). "Mayor and staff bask in the glow of the stimulus – Oakland North : North Oakland News, Food, Art and Events". Oaklandnorth.net. Retrieved August 26, 2012. ^ "Buy Penny Stock Online - Where To Buy Penny Stocks - Berkeley Daily". July 30, 2017. Retrieved July 30, 2018. ^ Johnson, Chip (November 2, 2007). "Dellums, Oakland City Council fritter away the year". San Francisco Chronicle. Retrieved November 18, 2007. ^ Johnson, Chip (June 18, 2010). "Oakland Mayor Ron Dellums silent on budget hole". SFGate. Retrieved June 18, 2010. ^ Lee, Henry K. (November 4, 2009). "Update: Maldonado family pays tax lien". The San Francisco Chronicle. Archived from the original on January 3, 2010. ^ Gammon, Robert. "A Misdirected Missive". East Bay Express. Archived from the original on November 15, 2007. Retrieved December 23, 2007. ^ Wildermuth, John (January 6, 2008). "Dellums is behaving exactly as he said he would when campaigning". SFGate. Retrieved July 31, 2018. ^ Kuruvila, Matthai (August 5, 2010). "Oakland Mayor Dellums won't run for re-election". The San Francisco Chronicle. ^ "Former Oakland Mayor Ron Dellums Dies". ABC7 San Francisco. July 30, 2018. ^ McFadden, Robert D. (July 30, 2018). "Ron Dellums, Forceful Liberal in Congress for 27 Years, Dies at 82". The New York Times. Archived from the original on July 30, 2018. Retrieved July 30, 2018. ^ Reginald James (October 4, 2007). "Hillary Visits Laney". Laney Tower. Archived from the original on September 17, 2009. Retrieved March 14, 2009. ^ "Issue One – ReFormers Caucus". www.issueone.org. Retrieved July 30, 2018. Dellums victory signifies a sea change in Oakland politics San Francisco Chronicle, June 19, 2006. Ron Dellums's oral history video excerpts at The National Visionary Leadership Project. This page was last edited on 14 April 2019, at 05:33 (UTC).